Family association sites for genealogical research are similar to one-name study sites in terms of content, but they usually have an organizational structure (such as a formal association, society, or club) backing them. The association may focus on the surname as a whole or just one branch of a family. The goals for the family association site may differ from those for a one-name study. The maintainers may be creating a family history in book form or a database of all individuals descended from a particular person. Some sites may require you to join the association before you can fully participate in their activities, but this is usually at a minimal cost or free. 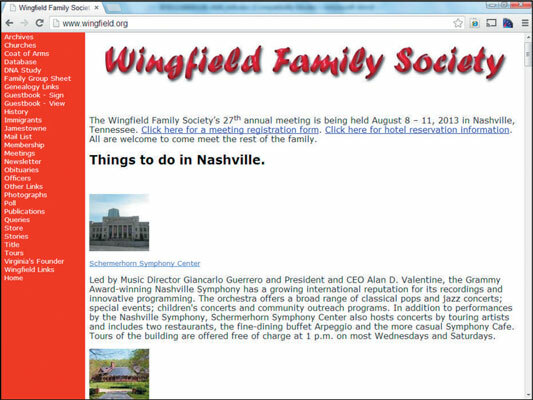 The Wingfield Family Society site has several items that are common to family association sites. The site’s contents include a family history, newsletter subscription details, a membership form, queries, mailing list information, results of a DNA project, and a directory of the society’s members who are online. Some of the resources at the Wingfield Family Society site require you to be a member of the society to access them. To find a family association website, your best bet is to use a search engine. Be sure to use search terms that include the surname you’re interested in researching and one of these keywords: society, association, group, or organization.